The Royal Game of Ur is a very old game…very old…and one I just discovered not long ago thanks to a chance YouTube video. It’s a fun, 2-player game that (re)kicked off a chase for wooden hobby games and other vintage/retro games. I have very fond memories of playing old wooden games in elementary school during indoor recesses. I first played Skittles in 3rd grade, only to be reminded of it 30 years later when I bought my own board at a garage sale. Other games like Nok Hockey, shuffleboard, and Rebound filled my childhood with simple fun. And even though a Nintendo would interrupt that analog fun a few years later, I’ve always enjoyed the “simple” games. When I saw a video explaining the Game of Ur, it looked like the type of game I would enjoy. 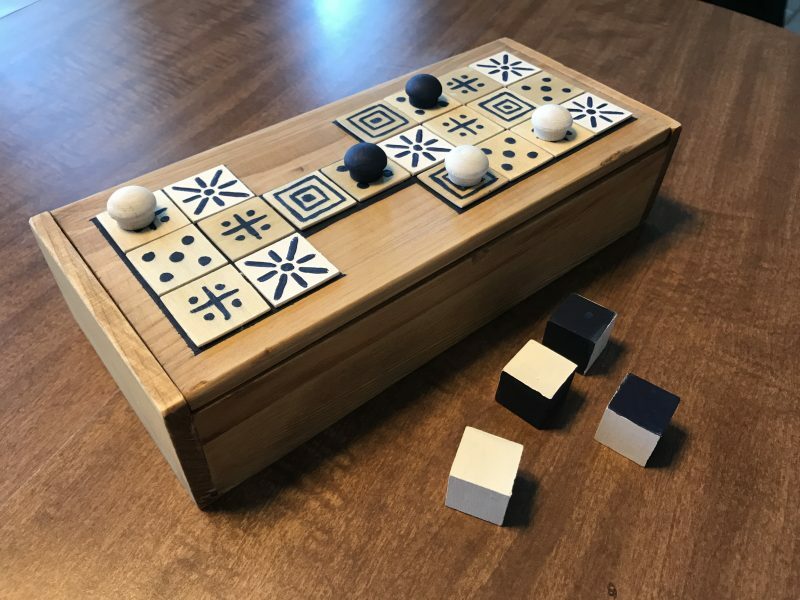 It’s a simple strategy game that is played on a board of 20 squares, the objective being to get all of your pieces around the board first. This is one of those, “sounds simple but isn’t” type of games. But it’s also a 2-player game, which is exactly what we need in our house. All too often great games are intended (or are much better) with 3 or more players, but that’s not always an option. So not only did the Game of Ur look fun to play, it looked fun to build. 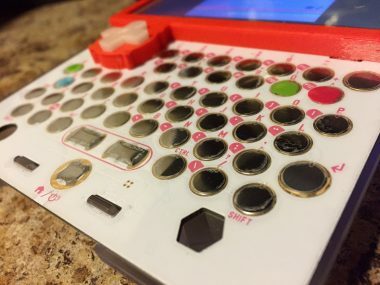 In all honesty, you could play with nothing more than a piece of paper, a few coins, and some dice…but why do that when you can have fun making your own set? I had scouted Pinterest to get some ideas and I saw one person that had made a board with a drawer. 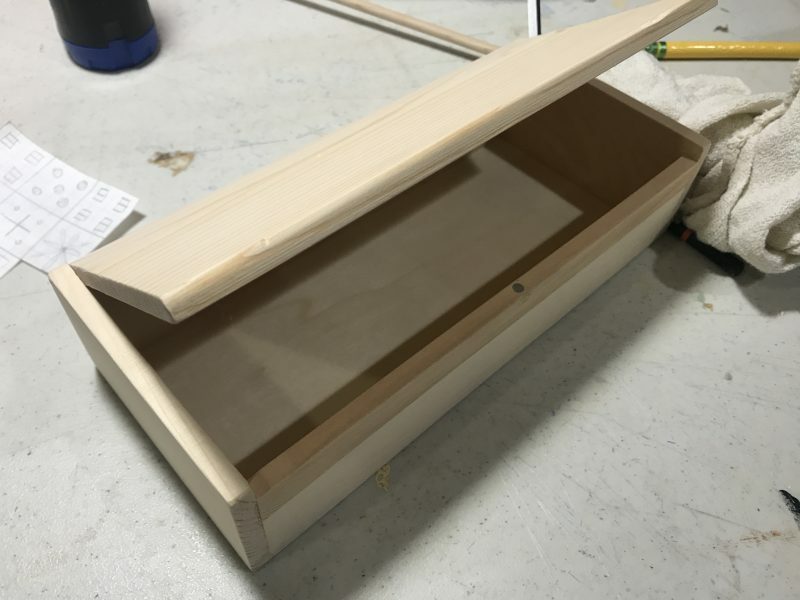 I didn’t plan on actually building the box itself, and finding one with a drawer was difficult. 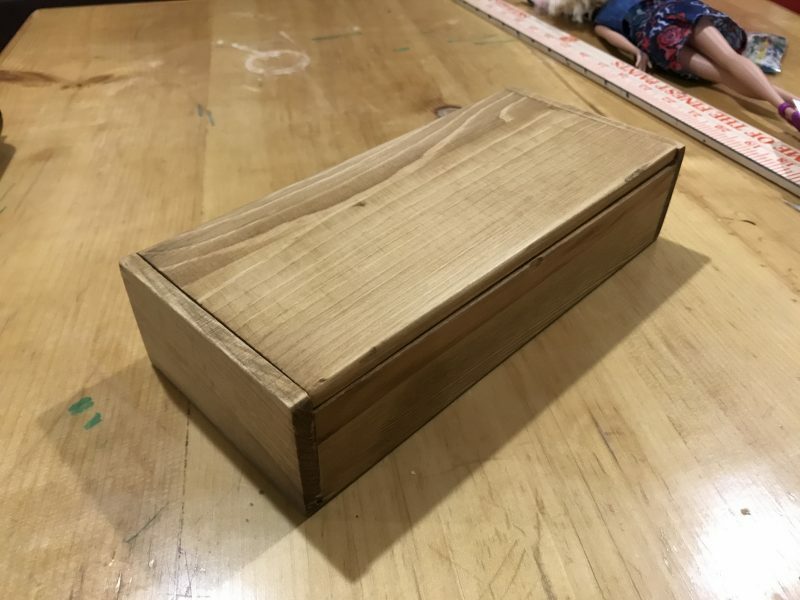 But finding a wooden project box with a hinged lid was as easy as going to Hobby Lobby. I found just about everything I needed at Hobby Lobby. 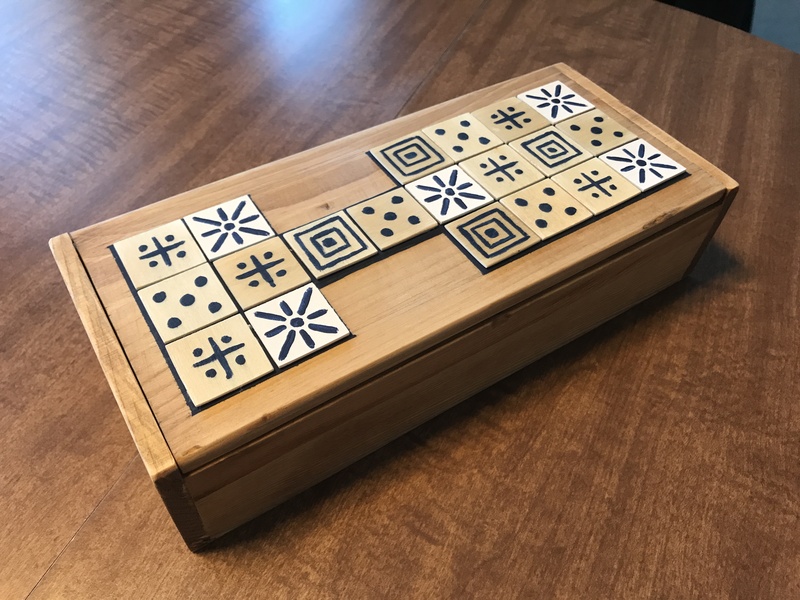 The box is 9″x4″ which is perfect for a Ur board with 1″ squares. I also got some little wooden markers to use a game pieces. The original Game of Ur uses 4-sided dice, which I had from some D&D sets, so those I already had. The wooden box was unfinished so I got some Golden Oak stain from Home Depot ($6), and then cannibalized a cheap wooden chess set from the dollar store to use as board squares. Then another dollar or so for a bottle of blue paint. I also decided to put some felt in the bottom of the box, so add another dollar or so in for that. When it was all said and done, I spent about $15 to make this game box. Not a bad deal and it was a long weekend’s worth of fun to build. The build itself was pretty straight forward too. No cutting or fancy building needed. Some basic sanding, staining, and painting is all the skill you need to make your own. Golden oak stain turned out to be a great color for the unfinished wood. I had never used wood stain before and this was a great excuse to learn…it’s easy. Just brush on the stain and wipe it off. Sunday morning. Next, I cut some felt and glued it to the bottom. It not only looks nice and gives it that sort of “fancy” appearance, it just quiets things down once you have your pieces and dice inside. My original plan was to just paint the squares on the top of the lid, and I had started that process, when I discovered a bag of wooden balsa chips in a baggie. They were chips with chess pieces printed on them, like a travel game of chess, and thankfully they were blank on one side. They also happened to be 1″ squares, which was the same size I had already painted. So quickly, I abandoned painting the lid and instead used the wood chips as board squares, and I’m glad I did. Having the raised chips on the lid add a little bit more pizzazz to the whole thing and also look a lot more inviting when the box is just laying out. I hand painted the designs on each chip and then lightly stained them before using some wood glue to adhere them to the lid. Hand painted wooden chips for board squares, lightly stained. I know it’s not a perfect paint job but I honestly like the handmade, imperfect look. Plus, go check out the actual Game of Ur board dug up from 2500 B.C., it’s far from perfect too. I’m very happy with this little game project and I hope it’s a game we’ll play in our family for years to come…maybe even something that stays around for a few generations. We’ll see. 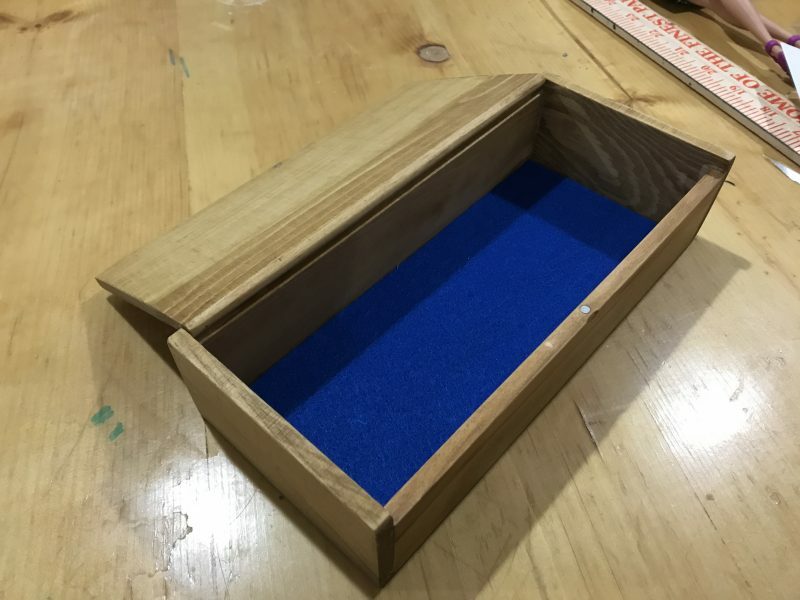 Handmade Game of Ur board from a wooden box.